Sunway Hotel Georgetown is one of the most popular hotels in Penang. It is located at the heart of Georgetown, Lorong Baru (Right beside Jalan Macalister) a street that is famous for all the delicious local food. My last visit to Sunway Hotel was many years ago, way before they renovate the hotel and reopen. It feels quite good to be back as it this hotel have been refurbished to a brand new one, and still maintains it's style and welcoming culture like the last time. Sunway Hotel Georgetown is offering their buffet themed Wild Wild West featuring cowboy style buffet every Saturday night. All the waiters and waitresses dressed up as cowboy and cowgirl to serve around the restaurant throughout the night. Sometimes I do crave for Thai food, especially when I think about spicy and sour tomyum, delicious green curry, Pad Thai and many more. Now Zest Bar has launch their latest Thai a la carte menu specially caters to people who loves Thai food, and it is available all day including lunch time and dinner time. GLOW Hotel was originally from Thailand, and therefore Zest Bar is rather different and special too where they offer Thai food instead of international dishes or buffet. GLOW Hotel by Zinc can be easily spotted when you pass through Macalister Road, which is also one of the busiest road in Penang famous for hawker food. Japanese food is my all time favourite, whether is it Sashimi, Bento, Sushi, Curry and many more. This time, I'm really happy that I get to try some Japanese Curry in a newly opened restaurant in Penang. Kai Curry Bar is a newly opened Japanese restaurant that only serves Japanese Curry alone with some side dishes. All the curry are homemade by the lady boss herself instead of those instant Japanese curry and therefore, you may find the curry here totally different with what we usually had in other Japanese restaurants in Penang. Before you scroll down, just a short introduction to the shop owner, Magdalene Chow. She was a teacher in Penang. And slowly moving into culinary business as it is her favourite hobby, which is to cook. She's mother for Kai, which the name Kai Curry Bar was named after her son. Magdalene emphasises on healthy food and lifestyle, which means her food are also good for children too. All the ingredients were prepared by Magdalene herself, including the curry powder. She would go to the market and purchase all those spices and mixes her own curry powder instead of using instant packing stuff. Even the breadcrumbs that she uses to fry food are prepared and blended by she herself. So Kai Curry Bar would be your healthy choices and also the Japanese Curry here would taste different from those we have tried at other Japanese restaurants. directly opposite Union Primary School of Burmah Road. but customers may park infront of Kai Curry Bar if there are space available. Goût de France / Good France Dinner @ 1885, Eastern & Oriental Hotel Penang. 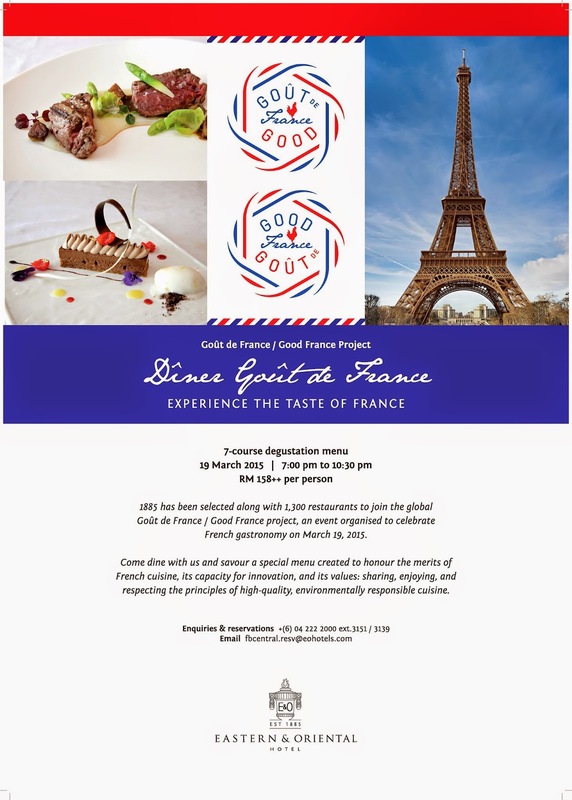 1 dinner to celebrate French gastronomy around the world"
On Thursday, 19 March 2015 Franch's gastronomy will invite the public to share a "French dinner" in around 1,300 restaurants all around the world. Goût de France / Good France is organized by Alain Ducasse, one of the most famous chef in the world. In conjunction with the Goût de France / Good France Project, France is bringing together more than 1300 chefs from around the world who will use the French culinary to express their talent and expertise through 1300 menus. 1885, an outlet of Eastern & Oriental Hotel is one of the participating among the 1,300 restaurants, which is also the only outlet in Penang to be part of Goût de France / Good France Project. Whereas there other 5 restaurants would be in Kuala Lumpur. Chef Michel Camy is the newly appointed Executive Chef of E&O Hotel. He will be representing E&O Hotel for the Goût de France / Good France Dinner, where he will master mind behind the dinner. The French Chef to prepare the French dishes, and also best pair with French wines. Chef Michel Camy(left), the newly appointed Executive Chef of E&O Hotel and Mr.Harold Rainfroy, the Hotel Manager of E&O Hotel. They are sharing the information regarding Goût de France / Good France Project. Both of them are from France. The table set up for the food tasting event was lovely, I love the ambience of 1885 that comes with such romantic environment for dining. The service was excellent too, as the staffs are very attentive, friendly and helpful. So on that night, we get to enjoy the 7-course degustation menu prepared by E&O Hotel will be served on 19th March 2015. This promotion will be available for one day only. It will be charging at RM158++ per person, and RM300++ for wine pairing.